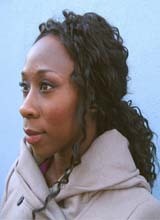 Esi Edugyan is a name on everybody's lips right now. And so you're saying it correctly when you tell your friends about her, it's ESS-ee Ed-OO-jin. Edugyan is a 33-year-old author whose second novel, Half Blood Blues about a black jazz musician's disappearance in 1939 Berlin, just won the $50,000 Scotiabank Giller Prize for 2011. Edugyan is also one of two Canadians (along with Patrick deWitt) to be shortlisted for the 2011 Man Booker Prize. Her debut novel, The Second Life of Samuel Tyne, was published in 2004, when Edugyan was just 25. Edugyan talked to us about work-life balance (while juggling her beautiful month-old daughter, and her suddenly-in-the-spotlight career), the book she has spent more time reading than any other, and her forays overseas. AbeBooks: How did it feel to be not only long-listed, but short-listed for the Booker Prize? Esi Edugyan: Completely amazing, and totally unexpected. The book was with a small publishing house in England, and getting it published here (in Canada) had some trials – the house we were originally with sadly went bankrupt, and having something so enormously positive happen here was mindblowing and unbelievable. Between that and the baby it feels unbelievable. It feels like everything good happening all at once. Abe: How are you managing balance between – your new daughter and your career? Esi Edugyan: I don't even know if I am – but you know…you do it, and even when it's hard it just feels like so much good that you really can't complain even when you're exhausted and have slept two hours total. And the baby, she's so lovely and beautiful and calm that it helps. She hasn't been colicky at all, and cries for very specific things. We've been told we're very lucky, and I feel that. We're even going to attend the Booker Prize dinner (in London, England on October 18th) – these things just don't happen every day. Abe: Where did your title, Half Blood Blues come from? Is it a real jazz song? Esi Edugyan: No, it's just from my imagination. Often when it comes to titles, I start with a working title, and it changes midway through or at the end, when the story and characters have formed and developed more. But in this case, it was the working title. I did try to change it – to what, I won't tell you, as it was really quite bad – but thankfully, I was talked out of it, and the book remained Half Blood Blues. Abe: The story is set in Berlin and Paris, and America. As a Canadian, with Ghanaian heritage – what drew you to write about WWII Europe? Esi Edugyan: I was living in Europe on and off from 2005 until 2010 or so, and doing various residencies in different countries. My longest was in south Germany, in Stuttgart. I was taking German lessons, and writing and learning, and started wondering about the history of black people in Germany. I began doing some research and became more interested the more I found out. I met with an American scholar in Munich, and she directed me to some other bits of research, and it went from there. Abe: What kind of research did you have to do for Half Blood Blues? Esi Edugyan: There aren't tons of resources on the history of black people in Europe during that time. Some books were very helpful to me: Hitler's Black Victims: The Historical Experiences of Afro-Germans, European Blacks, Africans, and African Americans in the Nazi Era by Clarence Lusane; Different Drummers: Jazz in the Culture of Nazi Germany by Michael H. Kater; Destined to Witness: Growing Up Black in Nazi Germany by Hans J. Massaquoi; and Harlem in Montmartre: A Paris Jazz Story Between the Great Wars by William A. Shack. Also, obviously there are tons of books about WWII from various perspectives, so reading general histories as well as those few specific books really helped. And talking to people was perhaps the most useful. My German teacher was wonderful, in terms of speaking about her father and their war stories. And all kinds of people who were so generous with their stories about their parents or grandparents in the war. That helped to get a sense of that time. There was a lot of invention and imagination as well, of course. Abe: Who was your favourite character to write, and why? Esi Edugyan: Most of my characters came to me fully formed, with their own personalities. Some did take some more coaxing and fleshing out, like Ernst (one of the white members of the jazz troupe, and from a wealthy background) - he took a few more drafts to really congeal and become who he was, perhaps become he was more background. But (the three main musicians and characters of focus) Chip, Sid and Hiero were all exactly who they were from the very beginning. Chip was the most fun to write because he was so obnoxious, shameless, ruthless and still ultimately sympathetic. He would get in someone's face and say whatever he wanted to, but was still lovable and human. He was great fun to write. Abe: Was there a particular memory or experience in your own life that you drew on for the novel? Esi Edugyan Probably the experience of going abroad, creating art and meeting other artists from different countries. Working together, creating together and collaborating together. People came from everywhere around the world, and we were all living in the outbuildings of this German castle – it was something like Magic Mountain. Everyone was young, under 35, full of passion and learning art. A lot came out of this experience – it was truly one of the defining experiences of my life so far. Abe: Who are some of your favourite writers? Esi Edugyan: Definitely Leo Tolstoy. I was actually somewhat obsessed for years, constantly rereading War and Peace. I was living in Toronto when I first finished it, and I remember finishing the last page and thinking "Oh, my God", then reopening it at the beginning right away and starting again.I then explored it in various different translations. I was really in a more learning stage then – though, of course you're really always in a state of learning as a writer, but then I was just immersed - and I found the text amazing. The characters were so fully realized. He writes women, men, children, everyone – and they are all so perfect and fully realized and particularly themselves. That was a huge book for me. As well, I've been especially struck by the work of V.S. Naipaul, and more recently by Roberto Bolaño, someone I discovered in the last few years and think is amazing. I've been reading and enjoying Hilary Mantel. As for Canadian writers, I greatly admire Michael Ondaatje. I couldn't make it to his recent Victoria reading, as my husband (poet and author Steven Price), was actually doing a reading the same night. I'm also an enormous fan of Alice Munro and am always rereading her. She's so original and delicious. And Mordecai Richler, too. I loved Barney's Version –he's such a rotter. Richler is really a great writer. Abe: If you weren't a writer, what would you be? Esi Edugyan: I honestly don't know. On those days when you're having problems and dreaming of greener pastures, you know, you think about it…I thought I'd study law or might do something else artistic – like dance, perhaps. Definitely something creative. As an adult I took a lot of dance classes, but wish I had danced as a child. Or singing. I would love to have trained my voice up. Abe: What are some favourite perks and frustrating pitfalls of being a writer? Esi Edugyan: When you're at the beginning of a project and it's not flowing smoothly and you work for hours and basically you're writing a three-sentence paragraph over and over. It's frustrating, but even that is not so bad. I don't really believe in writer's block – if something isn't coming, I think the angle from which you're entering the work is not right, and you just have to change it. I think the business is difficult – getting an audience in all of this, I mean. You finish a book and you're really excited, and it might not perform the way you (or others) want it to perform, and you wonder why certain books aren't more celebrated, and why others are, and so many great books seem to slip through the cracks. It can seem quite arbitrary. The whole route to publication can be so fraught as well. After the first publishing house we were with on this side went bankrupt, we didn't have a real sense of what was happening and how it would turn out. And it's rough to see a Canadian house go under. So the book was homeless for several months, and that was nerve-wracking, and had me biting my nails every day. And then it was bought by Thomas Allen – they're a great house, and in the end so it all worked out, but it was stressful. Abe: Can you tell us a bit about your next project? Esi Edugyan: Sure, but only a bit. I'm quite superstitious! But to give you a general idea , I will say it's a novel with a Canadian setting.